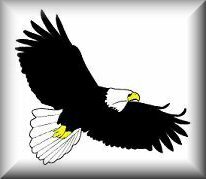 Why is there a "bald spot" on Bald Eagle Mountain? A prominent, tree-less portion of the northwest-facing slope of Bald Eagle Mountain between Castanea and McElhatten has been dubbed the "Bare Spot" in some historical accounts, "Snoopy on skis" by students, and other names over the years. This feature, formally know as a felsenmeer, has an interesting geologic history, actually owing its origin to the past Ice Age. Looking eastward from Lock Haven in the summer, this spot on the hillside attracts the eye because of the stark contrast between the surrounding green vegetative cover and the gray, irregular break in that cover. In winter, its snow blanket often sets this region apart from its surroundings. So, what is the nature of this feature? This hillside bald spot is simply a concentration of sandstone boulders on the surface of the slope. Here, there is an absence of soil and fine-grained Earth materials; openings exist between the boulders. Any fine-grained material generated by weathering will move down and into the openings. As a consequence, soil does not accumulate easily, and the boulder concentrations are devoid of vegetation, or, at best, support only a sparse scattering of stunted shrubs and trees. Like those throughout the Ridge and Valley terrain of central PA, this felsenmeer is a surficial deposit, a mantle of boulders and blocks overlying the bedrock. Also referred to by geologists as boulder colluvium or a blockfield, this deposit comprises boulders that typically exceed 256 mm (>10 inches) in diameter, and range from angular to sub-rounded in shape. It differs from a talus deposit in that the rock debris did not "fall" and accumulate at the base of a steep cliff. 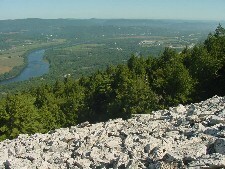 These boulders derive from the thick sandstone bedrock units that underlie the upper slope of Bald Eagle Mountain, and, over the millennia, have moved slowly down the slope to their present position. The actual thickness of this deposit has not been reported, but in similar accumulations, a minimum of several feet has been measured. The adjacent soils contain high concentrations of similar rock fragments. Rock units exposed at or near the mountain's crest are subject to weathering. The resulting solid rock debris moves down-slope under the influence of gravity. Eventually, materials collect at the bases of slopes where they undergo erosion by streams and rivers. These waters transport rock debris downstream. Ultimately, some of the debris reaches the coast and it will be deposited in the ocean basin. One outcome of this collective set of processes: over time and distance from the source area, solid particles decrease in size. The time frame for these natural processes can not be measured in human life spans, but requires tens of thousands of years or more. Once rocks are unearthed, either through major tectonic processes (e.g., rifting, uplift, mountain-building) or the more mundane weathering processes, they are attacked by a variety of physical and chemical weathering processes. Climate also plays a significant role because (a) it governs the amount of water available, and, (b) it controls the temperatures. As a general rule of thumb, warmer temperatures and more water facilitate chemical weathering, whereas, cooler temperatures and less water favor physical processes. Physical weathering ultimately generates greater surface area so that chemical processes proceed more rapidly. This surficial deposit formed during the Pleistocene Epoch, that segment of geologic time often referred to as the Ice Age. During this epoch, massive ice sheets moved southward into PA from NY and Canada many times. Both the northeastern and northwestern parts of the state were covered by thick ice sheets. Field evidence indicates that glacial ice covered much of Lycoming and Potter counties, and at least one ice sheet extended as far west as the confluence of Bald Eagle Creek with the West Branch Susquehanna River just east of Lock Haven. However, the deposits are not a direct result of glacial ice movement. They derive from the indirect effects associated with the presence of nearby ice and its influence upon the climate affecting the region at the time. When the ice sheets were nearby, tundra conditions were the order of the day, and the climate that accompanied the ice extended well beyond glacial margins. Conditions were much colder and harsher than anything we presently experience at our latitude and elevation. Not only did colder temperatures and less precipitation affect the biota, these factors impacted local weathering processes. Thus, "periglacial" (around the glacier) features were generated by processes that were enhanced by the rigorous, cold climatic conditions. The effect of this harsh, "ice-age" climate on bedrock, soil, and older surficial deposits was to increase the rate of physical disintegration and to facilitate the down-slope movement of debris. The extensive, ridge-top exposures of dense, well cemented sandstone units underwent severe weathering during periods of ice advance and stagnation. Water, in the form of rain, snow-melt, and condensation, penetrated even the smallest cracks in exposed rocks. Freeze-thaw cycles operated then as now, but with greater rigor. As this water froze, it expanded, forcing cracks to widen, eventually splintering even the hardest rock, and generating large volumes of rock debris. This process has been variously referred to as frost riving, wedging, shattering, and splitting. Under these severe climatic conditions, the mass of soil, rock clasts, and bedrock on the mountain slopes was frozen to great depths. During the "warmer" months, however, temperatures often rose above and fell below freezing (0˚C/32˚F) many times affecting the surface, but rarely the subsoil. A variety of gravity-driven, mass-wasting processes, including creep, gelifluction, and solifluction, operated to concentrate and move clasts downward across water-lubricated terrain, no matter how low the slope angle. Over thousands, perhaps tens of thousands of years, these and other weathering processes broke down the rock exposures into the boulders we see today. As the extremes of the Ice Age waned, rates of physical weathering and movement decreased, and fine particles and soil filled in the spaces between the larger boulders. Throughout central PA, nearly all the steeper mountain slopes are covered with vegetation growing in boulder-rich soils generated by these processes. In some places, however, finer materials have not been able to gain a purchase between the boulders. As a result, patches like Lock Haven's "bald spot" developed. In time, voids will fill in, vegetation with take over, and even the larger boulder surfaces like ours will gradually disappear. The edges of some of the boulders in the exposure vary as to their degree of rounding. Abrasion through block-to-block contact during downslope movement smoothes some of the rough edges. But it is spheroidal weathering, a combination of physical, chemical, and biologic weathering, that day-in and day-out acts to remove sharp edges and points from larger rock fragments. The perception that this rounding requires long distances of transport does not apply, nor does it require severe climatic conditions to proceed. Spheroidal weathering has been operating since the fragments were first separated from the rock outcrop. In some small, steep gullies, down-slope movements periodically turned into rapid debris flows which spread out onto the valley floor. Farther to the east, at the McElhatten interchange of U.S. Route 220, debris flows generated a large alluvial fan, with its apex pointed into the water gap of McElhatten Creek. Similar fans emerge from many of the water and wind gaps along the ridges throughout central PA. These rocks, derived from the Tuscarora Formation and its associated Castanea Member, comprise very resistant, quartz-rich sandstone. This rock weathers very slowly and produces fragments ranging from large locks and boulders to fine sand and silt. The Castanea Member, originally named for exposures in this area, is red-brown in color and generates reddish and brownish rock fragments. The Tuscarora Formation weathers to produce white to grey colored rock debris. An excellent artificial exposure of these rock units occurs just upslope from U.S. Route 220 as it goes through the Mill Hall water gap on the northwest-facing side of the ridge. Geologists often bring students there to examine this exposure. Lock Haven's boulder accumulation is not unique. Similar tree-less patches can be seen on the steep north- and northwest-facing slopes of Bald Eagle Mountain and the west-facing slopes of Brush Mountain farther to the southwest. This ridge stretches from Williamsport to Altoona. Rock debris in these felsenmeer derive from the Tuscarora Formation. However, on the slopes facing southeast into Nittany Valley, the rock comprising these blockfields comes from upslope exposures of an older rock unit called the Bald Eagle Formation (see the photos below). 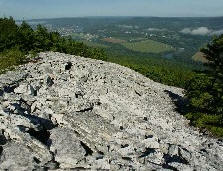 Bare patches occur on many other mountain slopes throughout the Appalachians of central PA and these derive from similar, quartz-dominated resistant rock formations. An artificial cut exposes a portion of the colluvium veneer that drapes across the steep slopes of Bald Eagle Ridge. This exposure is located on the west side of PA. Rt. 64 in the Fishing Creek water gap cut through Bald Eagle Mountain south of Mill Hall, PA. 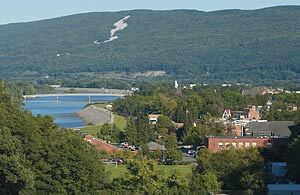 Note that here, Bald Eagle Mountain comprises two distinct ridges. The Silurian-age Tuscarora Fm. underlies the northern-most ridge; the Ordovician-age Bald Eagle Fm. lies beneath the southern ridge; and the Ordovician-age Juniata Fm. underlies the valley between the two ridges. 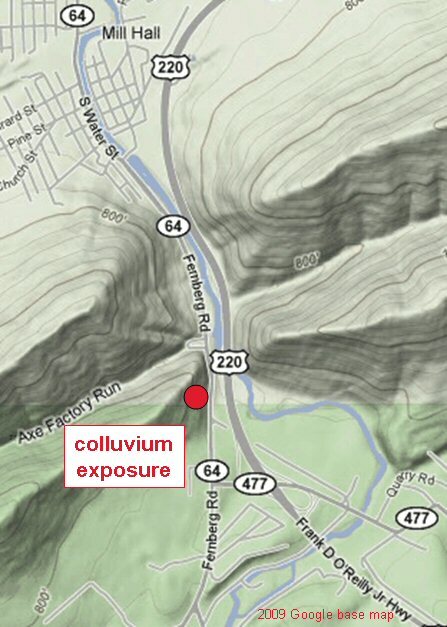 The colluvium layer is well exposed at this site. View is to the northwest, looking across Fishing Creek and PA Route 64 from the shoulder of U.S. Route 220. Networks of "rock streams" developed on mountain slopes. These concentrate and move rock debris down gradient just as "water-filled" streams do today. This colluvium layer comprises sandstone clasts derived from the frost riving of Bald Eagle Fm. exposures higher on the slope. These fragment range from boulder- to gravel-size. Sand dominates the zone directly beneath the coarser clasts. Boulder-sized clasts accumulate at the base of the slope. These clasts are extremely angular indicating that they have not moved far from their source-exposures of this sandstone unit near the ridge crest. Smooth, polished slickensides are common on many of the boulders in this exposure. The mineral quartz has coated the surfaces, and iron has stained the quartz. This felsenmeer comprises blocks of the Weverton Formation, a metamorphic quartzite from the Catoctin Mountains in eastern Maryland. At the same time the exposures of the sedimentary Tuscarora Fm. along the ridge top of Bald Eagle Mt. were contributing sandstone blocks to form “our” felsenmeer, this hard, ridge-making rock unit was undergoing weathering under similar periglacial conditions and generating blocks to make this field. Thus, the very same processes of frost riving and subsequent congelifluction operated in Maryland as they did in our backyard, demonstrating that the harsh conditions of the Pleistocene tundra climate extended far beyond our central PA region. The black dog in center is 0.5 m high. Photo credits: The two panoramic photos are courtesy of Mike Rickard. The center photo is used with permission of Lock Haven University of Pennsylvania. Physical interaction of particles undergoing transport to wear away sharp corners and edges of mineral grains and rock fragments. An outspread, gently sloping mass of unconsolidated boulders, gravel, and sand. This alluvium is deposited where a stream issues from a narrow, steep channel in uplands onto a lower gradient lowland plain. The solid rock that underlies gravel, soil, or other surficial deposits. A rock mass with a diameter greater than 256 mm (10 in), about the size of a volleyball. Loose, unconsolidated surficial materials that lie above bedrock and that have moved down-slope, away from their source rocks. The sedimentary rock layers comprising the upper portion of the Tuscarora Formation, a Silurian-age stratigraphic unit. The slowest of the continuum of mass wasting processes that facilitates the down-slope movement of material under the influence of gravity. Minerals, rocks, and soils generated by natural processes. These exclude manufactured or synthesized products. 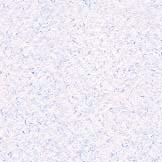 frost riving Equivalent to frost wedging, frost shattering, frost splitting. All are a result of freeze-thaw cycles where water freezes, expands, and generates a force sufficient to break rocks apart. These processes are actively occurring in high latitudes of both hemispheres and in high mountainous regions such as the Rockies, Alps, and Himalayas. Ice Age A time when large ice sheets blanketed much of northern North America in the last 2 million years. These sheets measured thousands of feet thick. Geologic evidence supports the conclusion that upwards of 60 advances and retreats of ice occurred in NA during this epoch called the Pleistocene. mass wasting The general term for those processes that move soil, rock debris, and even bedrock downslope under the influence of gravity. The rate of movement comprises a continuum ranging from extremely slow (creep) to very rapid (fall). They operate both on the land and in the sea, and they have been documented on bodies throughout the solar system as well. Pleistocene Epoch A time subdivision of the Neogene (Quaternary) Period, which itself is a segment of the Cenozoic Era. This epoch began about 1.6 million years ago. The last expansion of the polar ice sheets took place about 18,000 years ago. periglacial features Features generated under the harsh climatic conditions marginal to glacial ice. Periglacial processes include frost riving and freeze-thaw in a thin active soil layer and congelifluction during the warmer months. sandstone A sedimentary rock comprising sand-size (0.0625 (1⁄16 inch) to 2 millimeters) grains of minerals and/or rocks, in some cases set in a matrix of silt or clay, and consolidated by a cementing material, often silica, and less commonly calcite, hematite, or limonite. Depending on the source(s) of the sand grains, quartz and feldspar are common mineral components; rock fragments may also be present. Accessory minerals may include mica and one or more heavy minerals such as magnetite and zircon. solifluction The down-slope movement of water-saturated soil and surficial debris over impermeable material both within and beyond the permafrost zone. slickenline(s) A naturally polished rock surface. Often planar and striated, these occur on fracture/joint faces of rock that developed as one rock mass abraded another rock mass during faulting. (Rubbing coarse sandpaper across a polished glass surface produces a similar effect.) These surfaces may be mineralized, commonly with quartz or calcite. Slickenlines (the striae) are the narrow, parallel, closely spaced linear grooves on that surface. These grooves reflect the direction of movement. Some slickensided surfaces may reveal cross-cutting striae indicating reactivation of that faulted surface. spheroidal weathering A combination of chemical and physical weathering act in concert to round edges and corners of blocks of rock. Physical weathering, such as frost riving, generates greater surface area by breaking larger rock into smaller fragments. Subsequently, chemical weathering attacks mineral grains; for example, feldspar is converted to clay. Surface rounding is most noticeable on rocks of homogeneous composition, such as granite, basalt, and sandstone. surficial deposit Earth materials on the surface above bedrock. Usually, these are deposits are geologically young, and most tend to be unconsolidated. talus Rock fragments, usually coarse and angular, lying at the base of a cliff or steep slope from which they have been derived. tectonic Generally applied to the forces involved in, or the resulting structures of major, Earth-altering processes, including mountain building, faulting, and folding of rock units or large portions of the crust. tundra Refers to regions of the planet where permafrost exists. The soils tend to be thin and rocky. A tundra climate is characterized by long harsh winters with low average temperatures, little snow or rainfall, windy conditions, and a short summer season. Vegetation is restricted to grasses, mosses, lichens, sedges, and dwarf shrubs. Tree growth is limited by short growing seasons and low temperatures. These conditions characterize the Arctic and Antarctic regions and alpine terrains at elevations above the treeline. weathering A collection of naturally occurring physical, chemical, and biologic, processes that result in the generation of both solid (minerals, rock fragments, soil) and dissolved chemical products.